One evening when I was on my knees praying, God spoke to me: “What about those things you stole. What are you going to do about them?” I was surprised; I thought no one had seen me. Each time I prayed God continued to remind me of those things. God had forgiven me all my sins, but now I realized that, as a Christian, I should make this right. I sat down and wrote a list of all the things that I could remember stealing: pocketknife, flashlight, batteries, chocolate bars, etc. I had pictures of having to go to jail, and it was a real struggle to go and face the store owners. He asked me a few questions and seemed very surprised. I gave him the list of the things that I could remember stealing. He sat for a while figuring out what I owed. I paid him, and what a feeling of freedom came over me! I was walking on air. As I left the store, I turned and looked back and saw the manager standing, watching me with a strange look on his face. You know, if I hadn’t believed God and followed His promptings in that instance, I doubt I would have gone any further in God’s work or with Him. It was shortly after this that God filled me with His Holy Spirit. My father was saved some time later at the age of 75. On his deathbed he called for me to come and talk to him. He passed away at 76 years of age, and I’m happy that he knew the Lord and went to be with Him. Prayer is the greatest weapon God has given us. Prayer is powerful. Prayer is the power that moves the hand of God. Excerpt taken from I Sat Where They Sat by Arnold Bowler. Copyright © 2011. Published by Castle Quay Books. 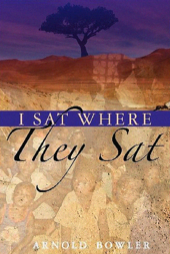 I Sat Where They Sat is available by contacting Wordcom Christian Resources at wordcom@paoc.org or (905) 542-7400, ext. 4248. Price is $21.95 Canadian (plus shipping and tax).